Celia Fiennes was born in Salisbury in 1662. Celia's father was a Colonel in the Parliamentary Army during the English Civil War. 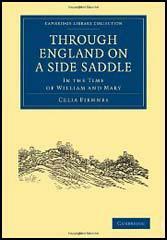 From 1685 until 1703 Celia travelled extensively around England. Apart from two servants, Celia travelled alone. On her journey Celia kept notes in her journal about the places she visited and provided the first comprehensive survey of the country since the one carried out by William Camden in 1586 (Britannia). Celia Fiennes died in 1741. Celia's journal was discovered in 1885 and published three years later under the title, Through England on a Side Saddle.